Facebook CEO Mark Zuckerberg today unveiled his company's revamped privacy tools in front of a corps of tech journalists that included organizers of last year's Facebook Redesign Revolt, PCWorld editors who drafted a Bill of Rights for Facebook Users, and many of the company's fiercest critics of its privacy policies. Responding to widespread user outrage and criticism from government and private advocacy groups, Facebook outlined a massive overhaul of the privacy controls that govern how users' information is shared on the site. "We listened to the feedback that we got, and we agree with it," Zuckerberg told assembled members of the press at the company's Palo Alto headquarters. "We're really going to try to not have another backlash." The major changes to the site's privacy options consist of a simplified set of controls that will let users opt out of three main types of information sharing: personal content, personal information, and the application platform. New users to the site should begin seeing the revamped tools immediately, while existing accounts will be migrated to the new tool set over the coming days and weeks. While many users have called for Facebook to change its default privacy settings to an entirely opted-out model, Zuckerberg explained that the company has chosen not to do so. "When people are able to share more, that leads to a world that's more open and connected," said the Facebook cofounder. "People want to share information, and they're best able to do that when they have control over what they share." 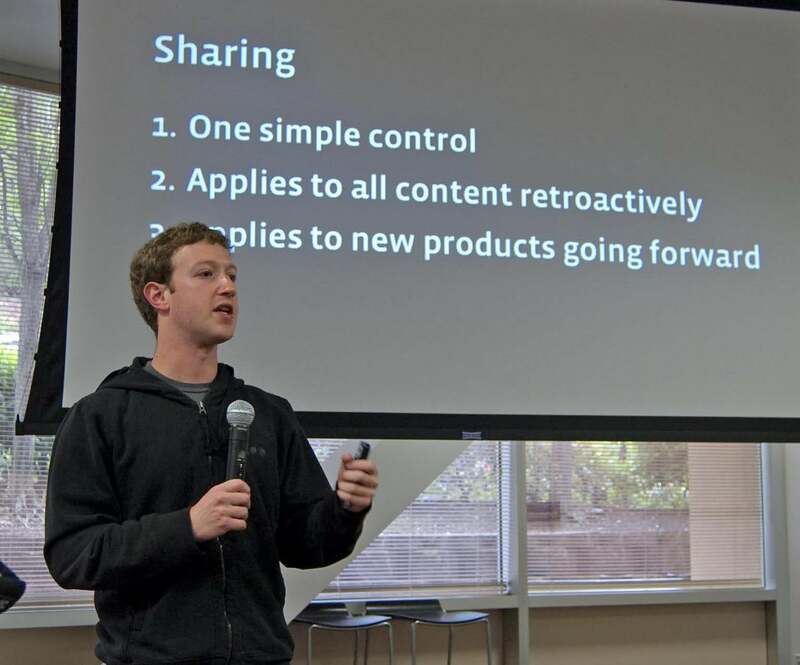 However, as Zuckerberg noted, the company has strong opinions about how sharing on the Web should be done. So the default settings will allow status updates, photos, and posts to be shared with everyone, and also allow photos you're tagged in, your religious and political views, and your birthday to be seen by friends of friends, while personal contact information will be kept private unless you alter that setting. The new controls also include options that should make it easier for users to opt out entirely from sharing information publicly with other users, sharing their profile with third-party companies through the controversial Instant Personalization program that connects Facebook accounts to other Websites, and sharing information with applications on the Facebook application platform. Once a user changes any of these privacy settings, it will be retroactively applied to all previously posted content. However, it is worth noting that any information already made public may have long since found its way into other databases created by social media data mining companies. So, while the changes from Facebook may help with new content posted in the future, they will not address any breaches of privacy that may have occurred in the past. Facebook has long framed discussions of privacy controls in terms of granularity vs. simplicity. As the site grew, the company added more granular controls to let users set specific sharing options. The new controls are aimed at simplifying that granularity for users who may not understand what information they're sharing on the network. However, Zuckerberg notes that "we like the granular controls and we're not taking those away." In addition to the simpler settings menus, users will still have the ability to customize settings for specific pieces of content, including shared photos and links, pages they've "liked," and application they've added. Zuckerberg claims that the new policies will mean less user information will be required to be public, though it is not clear yet which specific segments of data he was referring to. In responding to journalists' questions at the end of his presentation, Zuckerberg was careful to downplay the growing threat that regulatory scrutiny might pose to Facebook's business, arguing that while the company "engaged with a bunch of privacy advocates to understand their concerns" and "had conversations with senators," these changes were primarily prompted by user feedback. With no apparent sense of irony, he added: "The great thing with the Internet is that there's no shortage of opinion either on Facebook or on blogs, so it's easy to listen to what people are saying." Robert Strohmeyer is executive editor at PCWorld. He keeps his Facebook profile private, but you can follow him on Twitter at @strohmyPCW.